José and I have been working on a project to apply NILM methods to the health monitoring domain, specifically to help monitor the activity of elderly people living independently in their own homes. The approach we pursued aims to disaggregate the kettle reliably from smart meter data, without requiring any training in each home. We chose to use the kettle as the appliance of interest as it is an appliance common to almost all UK homes, is used regularly as part of most elderly people’s daily routine, and also has a signature which varies little between houses. The core novelty of the our work is that deviations in kettle usage from the normal routine can be recognised from the disaggregated smart meter data, allowing interventions in households to occur as soon as possible. Crucially, such routines are learned individually for each household, rather than using a static routine for all households. As such, kettle usage is used as a proxy for health, since no additional sensors were installed to directly measure health parameters (e.g. heart rate). An example of a routine for a single household is shown below. 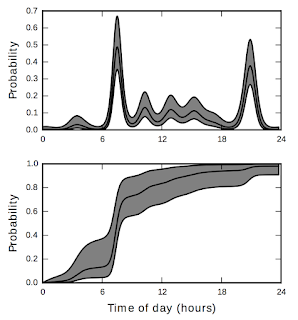 The top graph shows the probability that the kettle would be used at least once within a half hour interval, while the bottom graph shows the cumulative probability that the kettle would have been used at least once by that time of the day. It can be seen that for this household, a highly repeatable routine is followed, where the kettle is used by midday on about 80% of days. José Alcalá, Oliver Parson, Alex Rogers. 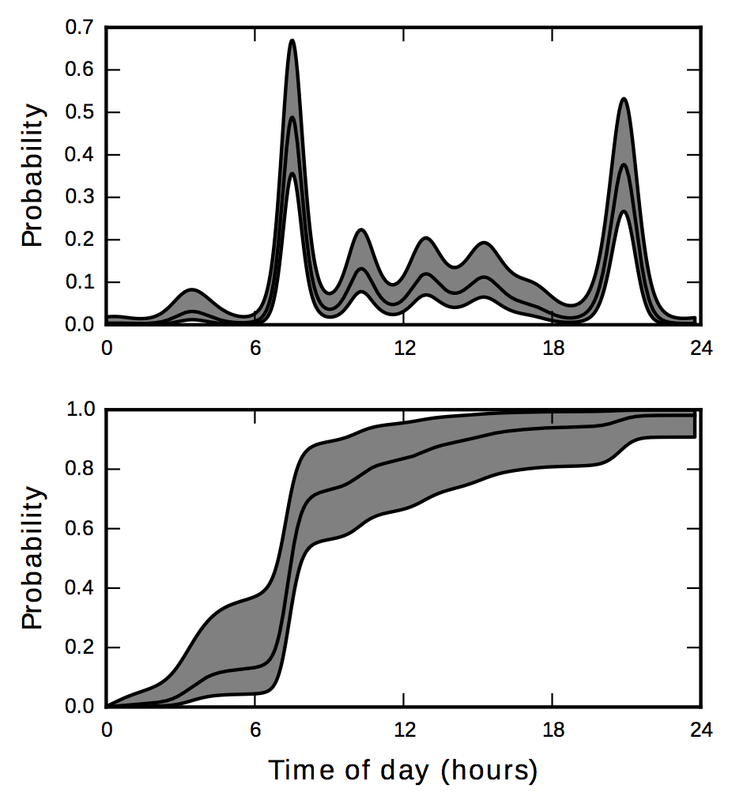 Detecting Anomalies in Activities of Daily Living of Elderly Residents via Energy Disaggregation and Cox Processes. In: 2nd ACM International Conference on Embedded Systems For Energy-Efficient Built Environments (BuildSys), Seoul, South Korea. 2015.